In each company business-processes are allotted among workers and departments. One the same process may be fulfilled by several workers simultaneously or by turns. In such cases it is quite difficult to define the reasons of delays, defects and narrow places during the process. The documenting of business-processes in the company is required. 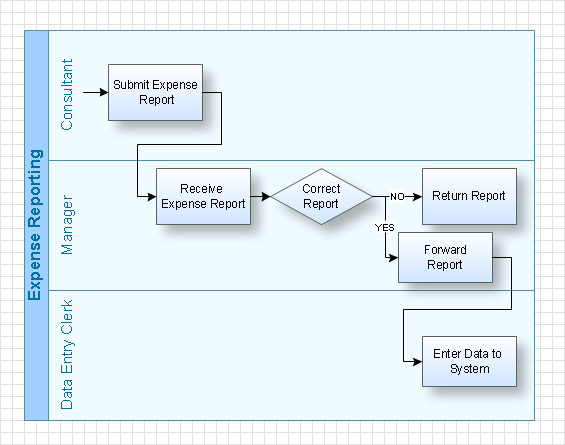 One of the tools for documenting of business-processes is the Swim Lane diagram. Swim Lane diagrams are the variety of process flow diagrams and are based on the IDEF3 standard. They were developed by Lynn Shostack for usage in projecting. 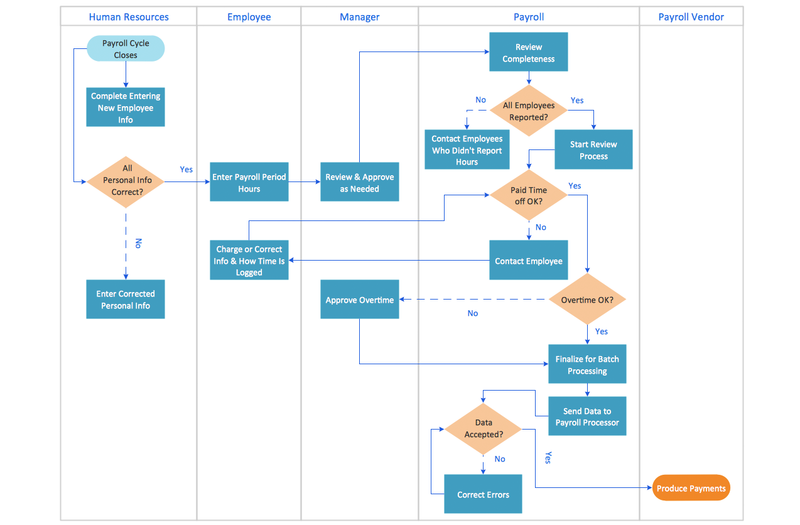 With their help organization diagrams are combined with process flow, as they visually display an object of the production system which is charged with given concrete processes in general flow of processes of the production system. Swim Lane diagram was named this way because all blocks which denote compound parts of processes are located on the definite lanes accordingly to belonging to responsible worker. Thus the diagram resembles a swimming pool with lanes. Lanes may be located either horizontally or vertically, depending on the existing process flow diagram. These lanes are denoted accordingly to resource name, which is charged with execution of the given part of the process. As s result, working process is found divided into parts, with indication of the responsibility for fulfillment of the given part of the process. This significantly facilitates the comprehension of the working process in general and helps to discover weak points, reasons of delays and defects and people responsible for them. With the help of Swim Lane diagrams you can always represent working processes of any complication in a simple and visual graphic form and define participants of separate parts of the working process. Besides, Swim Lane diagrams is a simple way to show responsibility zones of personal and interaction points of separate participants of the working process. Swim Lane diagrams are used in modelling of business processes BPMN and in UML methodology. Such diagrams are called Line of Visibility charts in IBM and Cross-Functional Flow Charts in MS Visio. It's incredibly convenient to develop Swim Lanes Flowchart in ConceptDraw DIAGRAM using the predesigned vector objects offered by Swim Lanes library of Business Process Mapping Solution. Drag the Swim Lanes Vertical object from the Swim Lanes library to the document’s page. Next add text to the diagram and format the objects. When releasing the mouse button, the object automatically resizes according to the page size. The Action button chain mode button mac allows you to easily add lanes and then equalize them. Add the shapes to the diagram from the Cross-Functional Flowchart library. They appear on the flowchart as connected objects. 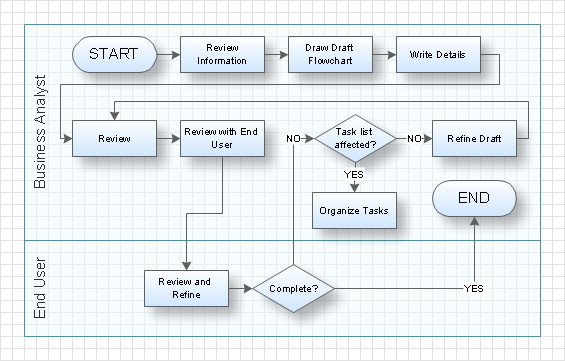 Result: A professional-looking flowchart, that demonstrates the document flow in your organization. ConceptDraw has 142 vector stencils in the 8 libraries that helps you to start using software for designing own Business Process Diagrams. Use Swimlanes library with 20 objects from BPMN.